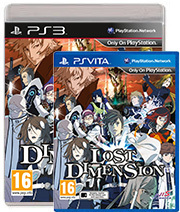 Lost Dimension | NIS America, Inc.
To subdue the threat The End poses to the entire planet, several countries create a special forces group called SEALED, which is comprised of eleven psychics with superhuman abilities. Each soldier has their own talents and skillsets to use in combat, which can be expanded after gaining enough experience in the field. Bonds of friendship will form amongst the members of SEALED, but be mindful of which allies to keep close, as The End mandates the player must begin eliminating teammates. Make sure to accuse the right teammate of being a traitor though ? once the final battle with The End begins any remaining traitors will fight the main character alongside him.